The BSO boogies is thanks to none other than frontman Brian Setzer, veteran of the ‘80s rockabilly revival and former leader of The Stray Cats. The rest of the ensemble definitely rock as a group, too, well beyond just supporting their star. And while there’s no violins or bassoons like at the symphony, behind a spiffy neon bandstand reminiscent of the big bands of swing era, Brian assembled a top flight group of musicians ready to blast the cobwebs out of your grandad’s old Victrola in their DC show on Nov. 30. I had the good fortune to catch the tour last year at the Warner Theatre. The Anthem is a lot bigger and a lot newer than the Warner, and The Anthem speaks of modernity whereas Warner breathes classicism. As such, The BSO at Warner last year had a feeling of warmth, and an organic nature to the acoustics. Speaking of seating, the floor at The Anthem Friday night had seats in place, and this is not as common. One of the ushers told me that the decision to offer seats rests largely with the artists, so thank you Brian Setzer and company. But having a seat wasn’t the biggest priority for everyone, and here the prize goes to The Anthem. The venue was very tolerant of swing dancers taking to the aisles, and the audience in general spent more time up on their feet. Considering the infectious grooves of the band, this was very much appreciated. Let’s talk about those infectious grooves. Holiday music is a tough sell for a cynical old Gen-X’er like me — unless it’s “Christmas Wrapping” by The Waitresses. But I will always make an exception for Brian Setzer and his crew. The man could put together a set of Sesame Street covers — and as long as he was riffing on that hollow body throughout, I’d be there. Brian’s guitar work did not disappoint on this evening, and the band was tight and energetic. Purple was the dominant color for the threads they bore as they took to the stage, replete with white fluffy trim and Santa hats. Brian Setzer strode on stage in a smart grey suit and opened with “Dig That Crazy Santa Claus” from their 2005 album of the same name. They covered some holiday favorites early in the set, including “Here Comes Santa Claus,” “Rockin’ Around the Christmas Tree,” and “Boogie Woogie Santa Claus.” The latter number featured a number of great solos both from the horn section and from the cat on the leopard print piano. The band offered up a diverse selection of non-Christmas oriented covers, too, including Glen Miller’s “In the Mood,” “Ring of Fire” by Johnny Cash, and “Hey Bulldog” by The Beatles (for which the girls singing backup got to take the lead — very nice!) “Jump, Jive, and Wail” was in the set, and while it is a cover, I will always associate it with The BSO, as it was their first bonafide chart hit as an ensemble. Longtime fans of Brian’s earlier work were treated to “Stray Cat Strut,” “Gene and Eddie,” “Fishnet Stockings,” and “Runaway Boys.” As with previous performances, Brian offered a solo moment with a lovely unaccompanied rendition of “Have Yourself a Merry Little Christmas.” This was followed by a moving tribute to recently departed guitar legend Roy Clark. Both were worthy of a lump in the throat. “Rock This Town” brought the main set to a close in raucous style, and the song offered a wicked drum solo to boot. Not to be left out was the band’s interpretation of “The Nutcracker Suite,” which was the first of two encores. The second was a hot rod rendition of “Jingle Bells,” for which Santa Claus appeared on stage and a glittering cloud of artificial snow fell from the rafters. Along with the killer light show, this is another one of those things that a big venue like The Anthem can pull off with much greater ease than the stately Warner theater. 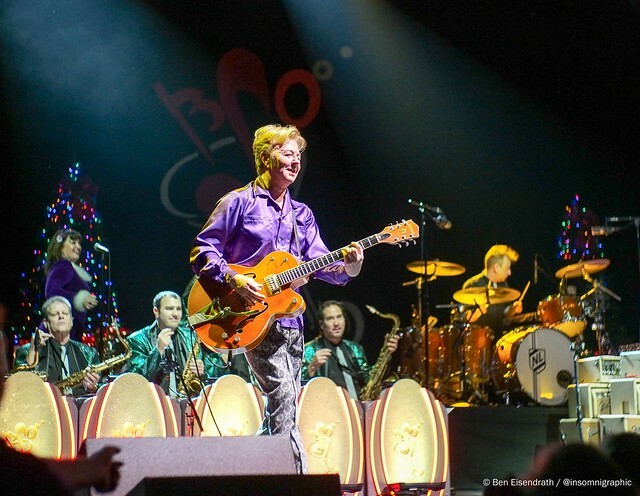 Regardless of your venue, however, The Brian Setzer Orchestra is a surefire way to have yourself a Merry Little Christmas, indeed! ← Poll: 2018 Thrushie Awards — Results!